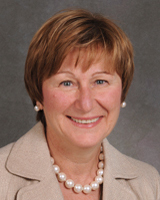 Lee Anne Xippolitos, RN, PhD, PMHNP, CNS, NEA-BC is Dean at Stony Brook University, School of Nursing. Dr. Xippolitos completed her PhD in Nursing at Adelphi University. She is a licensed Clinical Nurse Specialist as well as Nurse Practitioner in Psychiatric Mental Health Nursing. She also holds a certification as a Nurse Administrator through the American Nurses Credentialing Board. She is nationally and internationally known as a leader in Nursing education and practice. She specializes in program development as well as enhancing strategic clinical partnerships. This work was honored in 2015 by the American Association of Colleges of Nurses at their annual spring conference when the School was presented the “Exemplary Academic-Practice Partnership Award”. Currently, her specific interests focus on global education and culturally competent care. She has been appointed as the President of the International Society of Problem-Based Learning and is a strong advocate for inter-professional education. Additionally, Dr. Xippolitos is devoted to the creation of innovative programs to enhance education and improve clinical practice outcomes. She is a charter member of the Board of Advisors for Vizient’s National Residency Program and was elected to the position of President-Elect for the New York State Council of Deans   In addition, she serves on the Suffolk Care Collaborative’s Workforce Governance Committee and Workforce Advisory Group which aims to improve the health care workforce for Suffolk County, New York. Dr. Xippolitos has hosted multiple Knowledge Exchanges with Cheju Halla University and the Korean Armed Forces Nurses Academy in South Korea. These programs have brought over 60 South Korean nursing students to the United States to learn about the American healthcare system as well as to experience life at a New York university. Likewise, Dr. Xippolitos has been invited to speak at both South Korean institutions about inter-professional education and Nursing in America and was recently awarded the Cheju Halla Visiting Scholar Award. During Dr. Xippolitos’ tenure at the University, she has served as the Chief Nursing Officer at Stony Brook Hospital from 2001-2013 and in 2011-2013, she was both Chief Nursing Officer at the hospital and Dean at the School of Nursing. She draws from this experience in her current role as Chief Administrator at the School of Nursing.